Please contact me regarding the 2015 Fontaine For Rent - 53 x 102 container lock drop deck CA le - Stock# R6219 for sale at TruckerToTrucker.com. Take a look at this 2015 Fontaine For Rent - 53 x 102 container lock drop deck CA le. It is Stock# R6219 at TruckerToTrucker.com. For Rent - Fontaine Infinity TX (Twist Lock) 53 x 102 combo drop decks! Combination aluminum and steel construction with aluminum sides, rear and floor with (4) Apitong nail strips, 10    upper deck with 18    king pin, 43    lower deck with 40    loaded deck height, 12    crossmember spacing with coil package, rated for 55,000 in 4    concentrated, knee braces, rear axle sliding suspension with a 121    widespread in the open position and 54    in the closed California legal position, rear axle dump valve, winch track both sides with 12 sliding winches and strap keepers, (17) pair of pop up chain ties in floor, LED lights, grease hubs with a 5 year warranty, LP 22.5 on steel disc wheels, Hendrickson Intraax suspensions, (4) pair of twist locks to carry two 20' containers or one 40' container. 11,481#   s NOTE: Fontaine Infinity trailers have the most durable side rail design in the industry. Their side rail is an exclusive design called a Routed Aluminum Side Rail. We were so impressed we switched our rental fleet over to Fontaine exclusively. We have eliminated rub-rail damages common to all other flatbeds by changing over to the Routed Aluminum Side Rail. We can email you a link to a video that will give you a demonstration to the superior design. TNT Sales is your one stop shop for all open deck needs. We are a full service dealership including parts, accessories, rentals, repairs and reconditioning. We offer a used trailer warranty on our reconditioned used trailers. We stock and install-on-demand the following: Tool boxes, ramp kits, chains, binders, straps, bungees, bulkheads, headache racks, tarps, side kits, sliding tarp systems, aluminum wheels, new and used tires and everything you would need for your flatbed, drop deck or lowboy. We are well staffed, focusing on good customer service as well as service after the sale. Our good selection of premium products combined with our desire to make the purchasing process easy and timely for you will get you on the road and making money as quick as possible. Ed Sabol said it best    Quality is remembered long after the price is forgotten   . 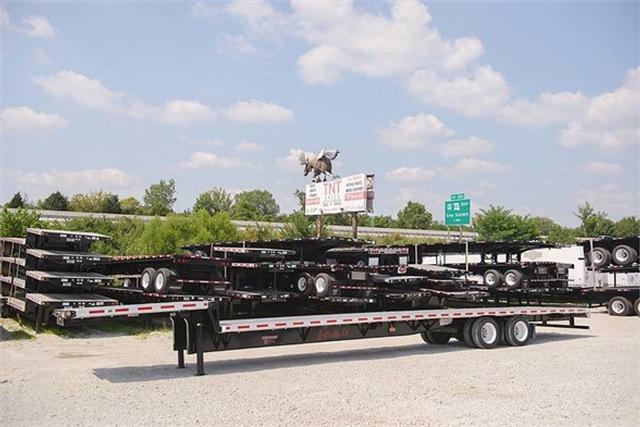 Disclaimer: Photos on the web are of units of our stock trailers. We order hundreds at a time and they are all the same when we place the order. Occasionally the factory will modify the specifications or we have used photos of a customer   s trailer that was passing through. Please go by the specifications on the listing and not the photos to avoid any misunderstandings. Thank you!